I had a relatively easy day planned, almost entirely on tracks, to take me from the Great Glen into the Monadhliath Mountains today - therefore I was in no rush to set off from Fort Augustus this morning! I enjoyed a breakfast of porridge in the hostel before chatting to my daughters using Skype via a somewhat more reliable WiFi connection than yesterday evening! After packing up I wandered down into the town centre to pick up a few supplies and post my Knoydart BMC map home. I finally set off walking that morning shortly before 10:30am and followed the B862 out of town around the southern end of Loch Ness before ascending steeply to around 200m to reach the start of the hydro road up Glen Doe. I soon passed SSE's "Soft Peat Storage Area", which was surrounded by warning signs - I wondered what they were storing it for? Around 500m up the hydro road I stopped for a quick break to apply suncream and re-hydrate - it was turning out to be hot and sunny today! Here I met John Braide, Chris Townsend and Tony Hobbs, and it was good to chat to them all as we continued on past a small lochan and on up into Glen Doe. Whilst we were resting, Alan & Phil and Chris & Tony passed us on their way to the reservoir. After we felt suitably refreshed, we continued on ascending via a series of broad zig-zags to reach the highest point of the hydro road near Lochan a'Choire Ghlais. It was now noticeably windier and less warm than on the way up Glen Doe, and the sky had also begun to cloud over. We descended south along the track to reach the memorial cairn above the new Glen Doe reservoir, where we met many other challengers: Chris, Tony, Alan, Phil, Andy, Vicky & Toby, most of whom seemed perplexed that John & I were walking in shorts today! 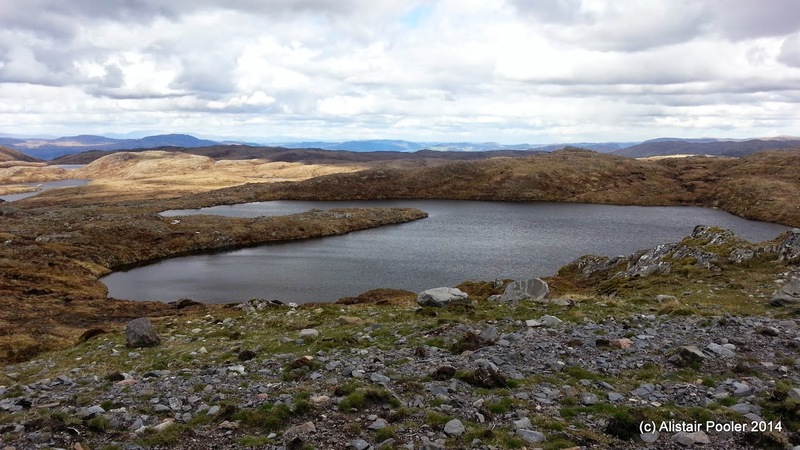 John and I continued to walk together as we headed east along the northern side of the reservoir heading further into the Monadhliath Mountains. There had clearly been a lot of work done around here in relation to the construction of the reservoir, as most of the burns we encountered appeared to have been canalised, presumably to increase the water flow into the reservoir so as to maximise the hydroelectric output. My original plan for the day had been to detour off to the south to bag the Corbett of Meall na h-Aisre, however I was still feeling tired after my three long days Munro bagging in the NW highlands at the weekend so I instead opted to skip this hill and stick to the track instead. This therefore meant that a few kilometres east of the reservoir, John and I parted company as he headed off into the hills to the south for a remote overnight camp. I instead continued eastwards along the reasonably level track to catch up with Alan & Phil. We chatted as we continued walking east, with Alan telling me what the area was like before the construction of this very long vehicle track through the wild land. It's a great shame that this was likely to have been my last opportunity to walk through this area before the construction of the controversial Stronelairg Windfarm, which is due to cover a large amount of this remote mountain and moorland landscape. We crossed the Allt an Dearg Lochain and the Crom Allt to reach a track junction on the far side, where we headed SE for a little under a kilometre to reach our planned campsite for the evening just beyond Chalybeate Spring at around 6:15pm. Here we met several other challengers and soon there was a collection of green, yellow and grey tents scattered around a lovely grassy spot near a stream confluence. More challengers arrived over the course of the next hour or two and we enjoyed a very sociable evening with plenty of cheese, biscuits, wine and whisky :-) After the sun had set the temperature dropped dramatically due to the clearing skies, so I soon decided to retire to the warmth of my tent for the night. Yesterday and today had certainly been a pleasant change from my first three days of my crossing when I hardly met any other challengers at all! After a good night's sleep, I enjoyed a leisurely start to the day at my B&B. 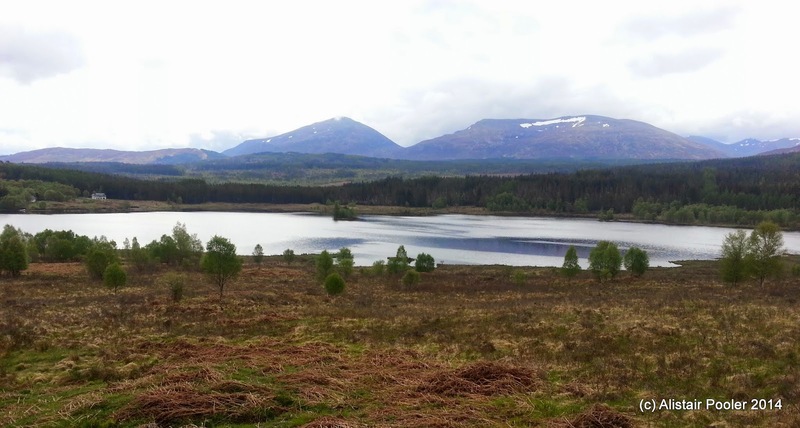 I finally set off walking again at around quarter to ten this morning and headed east along the minor road along the north side of Loch Garry for a couple of kilometres, with good views over to Ben Tee and Meall a'Choire Ghlais. Soon I reached the metal bridge over the narrowing of the loch and headed south past Torr na Carraidh along forest tracks. Soon I caught up with David Brown, a first time challenger from Baltimore and I chatted to him for a while as we walked along the forest tracks before we stopped to chat to Jim Taylor in Greenfield Wood. Aware that time was getting on and I still had a lot of distance to cover, I left them enjoying their cups of tea and continued eastwards through the Laddie Wood. The Forestry Commission have now started to have highland cattle roaming these woods, and today they seemed particularly keen on lying down in the middle of the track! After a bit more plodding along the track, I reached the Laddie shelter at the track junction for Ben Tee; I had originally planned to come this way back in 2010 but ended up on the north shore of Loch Arkaig instead. As I continued eastwards along the forest track from the Laddie shelter, the views opened up and I could make out my original planned hill for the day: Meall Dubh. The forest track made for reasonably swift walking and after a while I decided to leave it for a parallel looking newish footpath through the woods alongside the Allt na Cailliche. In fact it was just as well I did as the forest track no longer connects with the Wester Mandally road, and instead I crossed the burn at a new looking footbridge and made my way up to the road. (Unfortunately my phone chose not to track this section very well, so I can't be 100% certain exactly where the new bridge was!). After stopping for a quick lunch break near the western end of the road, I continued east to cross the River Garry by way of the A82 road bridge. I was drawn to the nearby Invergarry Hotel, where I found Alan, Phil and Andy enjoying a drink. I joined them for a refreshing pint of ale before we all set off for an afternoon stroll along the Great Glen, although the first few kilometres were unfortunately along the side of the very busy A82! 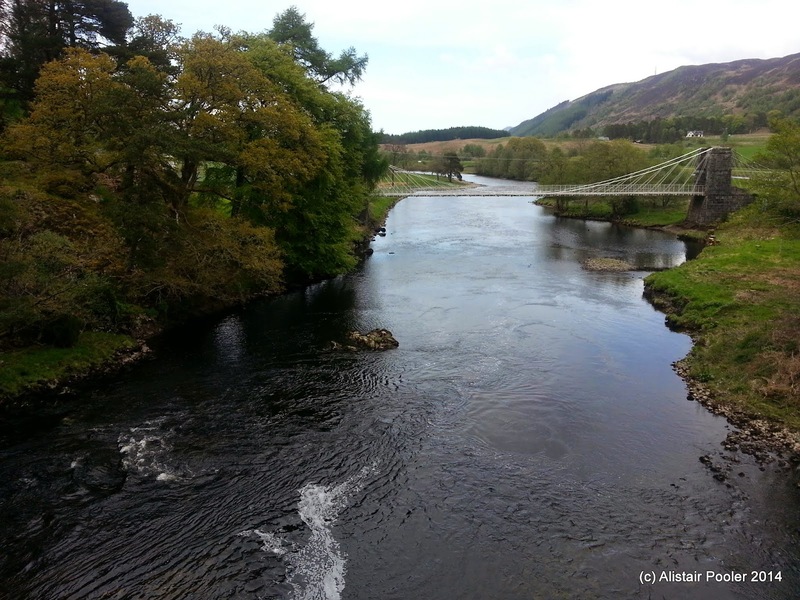 At the Bridge of Oich we picked up the more relaxed surroundings of the Great Glen Way along the Caledonian Canal. We stopped for a few minutes to watch the Bridge of Oich swing bridge opening to let a boat through, whilst queues of traffic built up on both sides of the A82. It was pleasant to have company for a change and I chatted to Andy, Alan & Phil as we continued northeastwards along the good track. 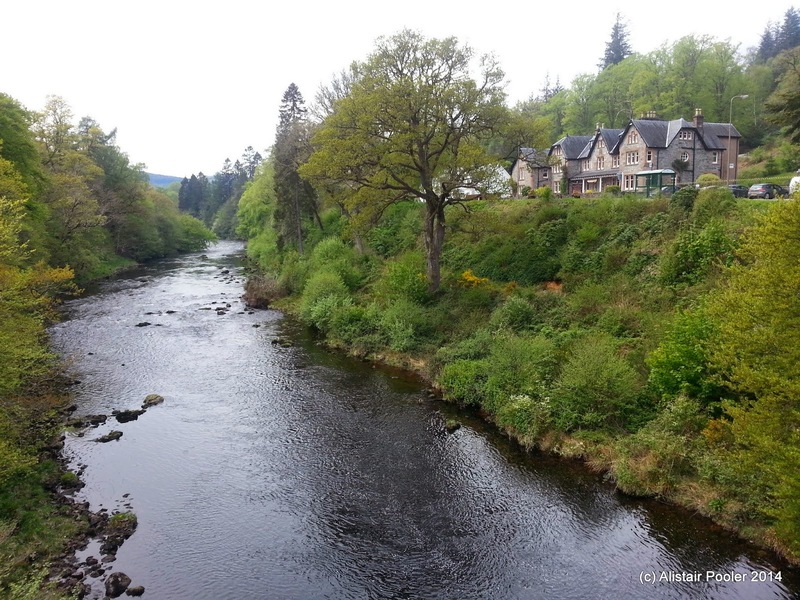 However after a while I realised that I was going to be late for my promised Skype video call with my three year old daughter, so I zoomed off ahead to get to Fort Augustus on time! I headed through the centre of town and on up to my booked accommodation for the evening at Morag's Lodge on the northern side of town, where I arrived at around 6pm. It was good to chat to Lynsey and my daughters, even though it was via a poor quality Skype video call over the hostel's busy WiFi.